Real Steel Champions (Free on iOS) – This latest installment in the Real Steel franchise from Reliance Games and DreamWorks Studios is based on the popular movie franchise, and is the first title in the series to allow players to build their robots before taking them into battle. The game features 10 new arenas, and gives players a “nearly unlimited” combination of parts to choose from. Once players have selected their robot’s torso, hands, legs (and more), they’ll take the robot into battle, with each robot having special and heavy attacks, access to critical hits and finishers. 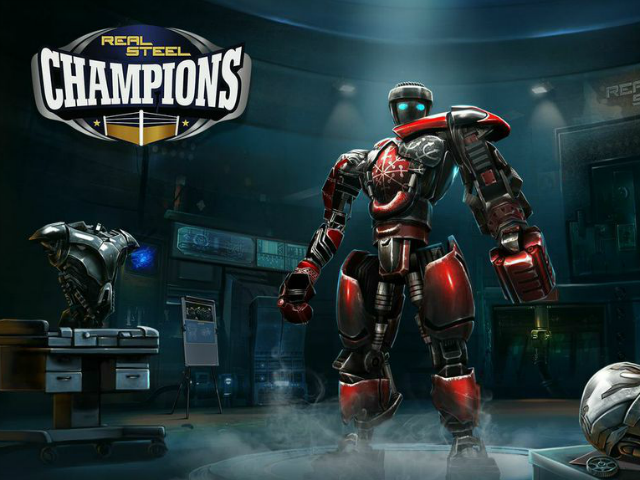 Real Steel Champions offer multiple game modes, including 90 Time Attack fights and a Tournament mode. Blood & Glory Immortals (Free on iOS, Android, Amazon) – The latest installment in Glu Mobile’s Blood & Glory franchise, Immortals has launched out of beta, and allows players to choose one of three heroes, taking them into dungeons in a ancient Roman setting. Players collect loot from fallen enemies, or breakable objects in each environment, and can fuse or evolve items to make them stronger. The game features a single-player campaign, as well as multiplayer guilds and real-time chat among players. TailsUp! (Free on iOS, Android) – Brought to life by the Association of Zoos and Aquariums (AZA), TailsUp is a charades-style multiplayer game, challenging players to identify pictures of animals using verbal clues from their friends. Like in the popular franchise, Heads Up!, one TailsUp player holds their phone near their forehead, where they can’t see the screen. The other player shouts out clues, with the goal of identifying as many animals as possible in each round. The game offers multiple picture decks, relating to different kinds of animals (water animals, endangered species and more). Proceeds from the purchases of additional or customizable decks goes toward AZA’s animal conservation missions. Magic Cat Story (Free on iOS, Android) – This puzzle game from Netmarble US follows Kevin the Cat on a journey to rescue his friends from an evil wizard named Constantine. The level-based title challenges players to remove blocks from the screen by dropping groups of additional blocks on top of them, making matches of four-or-more like-colored squares to remove them. Gamers can tap on the screen to rotate the orientation of the new blocks, before swiping down to add them to the board. Levels become more complex as players progress, introducing various obstacles and level objectives, from clearing a large number of blocks, to dropping key items to the bottom of the board (and so on), all without running out of moves. Magic Cat Story is also available on Facebook. Epic War TD 2 ($2.99 on iOS) – This tower defense game from AMT Games challenges players to complete 50 missions using nine basic towers and four “mega” tower varieties. Players will compete against over 40 different kinds of enemies, with the premium purchase meaning they won’t run into free-to-play barriers. Epic War TD 2 was previously released on Android. President: The Card Game (Free on iOS) – This card game from BulkyPix and Almateos is based on the the popular card game “President,” (also known as “Emperor,” “Landlord” and other names). In the game, players must get rid of their cards as quickly as possible, with suits being irrelevant, and gameplay focusing on each card’s rank. In each round, players remove their cards by playing the lowest card possible from their hand, which is also higher than the active card on the deck. While the game is rated for users aged 4+, it should be noted the game does include adult language, relating to a title given to a player after each hand. President: The Card Game is coming soon to Android.